Three times the firepower. Three times the class. This triple-barrel, non-firing flintlock reproduction just oozes with power and sophistication. Leave it to the Italians to make killing look so good. 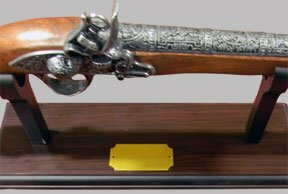 This flintlock is a reproduction of a 17th century pistol made for the famous Medici family. 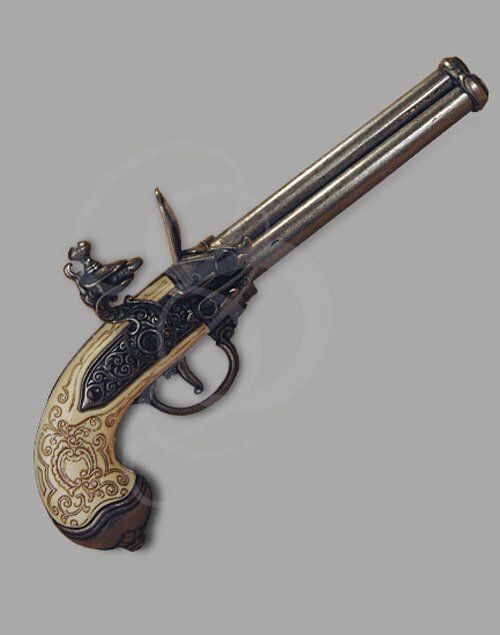 The original, made with an ivory stock and similarly engraved, was capable of firing three projectiles before having to reload. Quite important since the average loading time for a flintlock pistol was 3.5 hours (okay, maybe not that long). This reproduction has fully functional locks (for those of you hung over, that means that stuff actually happens when you pull the trigger). The brilliantly engraved locks are cast from a dark steel and bolted tightly to the simulated ivory stock. The stock itself is etched with reddish floral patterns and the famous Medici Coat of arms. The hammer holds a simulated piece of flint/saltpeter tightly between its arms. The original was made circa. 1680 by the famous Lorenzi family of Italy. It would have been a fantastically expensive weapon at the time and would surely have been used only by the upper crust of society. This item is a gorgeous collection piece and a fabulous addition to any costume. Particularly good for elegant pirates or other classy (but dangerous) gunmen.